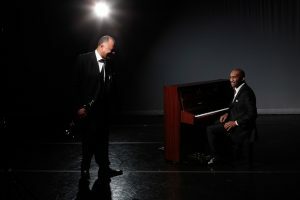 The Jazz Arts Group’s Inside Track series continues its 2013-14 season at the historic Lincoln Theatre with Columbus Jazz Orchestra all-stars Byron Stripling and Bobby Floyd in “Swingin’ the New Year” on Saturday, December 28. Byron and Bobby lead a small group with a celebration that is sure to beat the post-holiday blues and make you sing and dance! Special guests Jamey Aebersold, Larry Cook and Rich Thompson hit the stage with a Jazz Academy workshop ensemble that could include you! A spectacular trumpeter with a very wide range, a beautiful tone, and the ability to blend together many influences into his own style, Byron Stripling is also the artistic director of the Columbus Jazz Orchestra, leader of his own quartet, and constantly in demand to play with pops orchestras around the world. Byron is an extroverted performer who brings the audience into his music. The happiness that he exudes through his trumpet, his vocals and his words is reminiscent of Louis Armstrong yet very much his own. The passion with which Bobby Floyd plays piano, organ and keyboards are the result of his natural ability (discovered at the age of two), his love of music, and years of practice. Whether performing jazz or gospel, as a soloist, with a trio or big band, his feel is unique and inspirational leading him to many distinguished appearances around the world, including regular gigs with Dr. John and the Count Basie Orchestra. On Friday, December 27 from 10:00 AM to 4:00 PM, the Jazz Academy will give you the opportunity to dust off the horn, get out the sticks and shake off the holiday blues as you learn from and play for Byron Stripling, Bobby Floyd, and jazz saxophonist and music educator Jamey Aebersold as part of the “Swingin’ the New Year” Community Big Band workshop. On Saturday, join Byron, Bobby, Jamey, Larry and Rich on the Lincoln Theatre stage during the “Swingin’ the New Year” concert and give your families and friends the gift of a lifetime – the opportunity to see you play with some of the greatest jazz musicians in the country! Pre-registration is required (fee includes lunch at workshop and admission to concert) and available by visiting www.jazzartsgroup.org.